What does luxury mean to you? 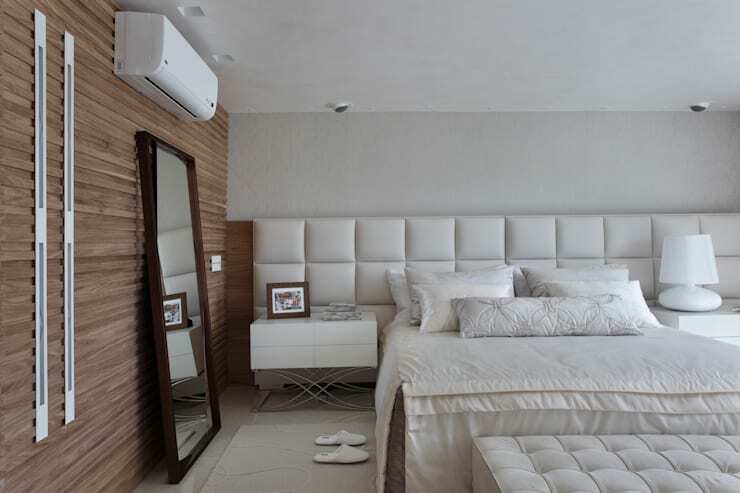 It’s possible, likely in fact, that you first think of innocuously decadent interiors, outfitted in the style of a hotel room and carefully designed to be devoid of all character. 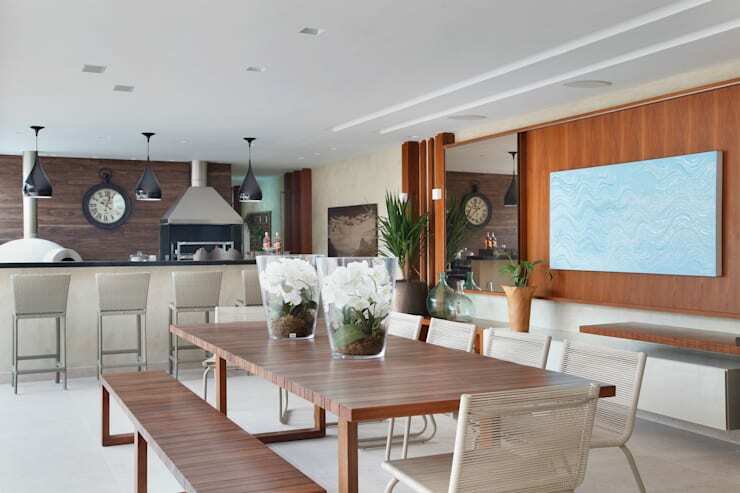 But as demonstrated by this villa in Rio de Janeiro, created by Leila DioniziosArquitetura e Luminotécnica, there are loads of ways to do luxury without losing the key elements of your own personality in the process. 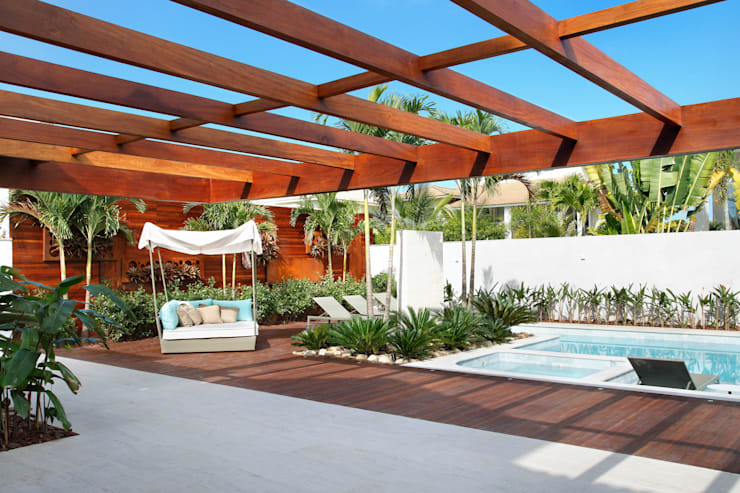 This wooden grid causes the shadows to fall in calming stripes across the sun-drenched garden and swimming pool. Expanses of decking are balanced by luscious greenery, and the three-seater chaise longue at the far end provides the perfect place to chill in the shade. 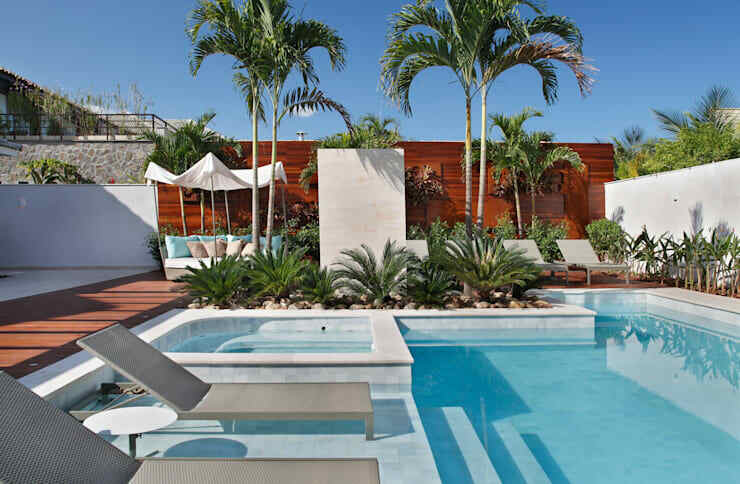 Sun loungers, submerged steps and an outdoor hot tub… it’s all textbook luxury so far, but things will take a turn for the personal one we enter the house itself. And here is that personal touch we’ve been waiting for. 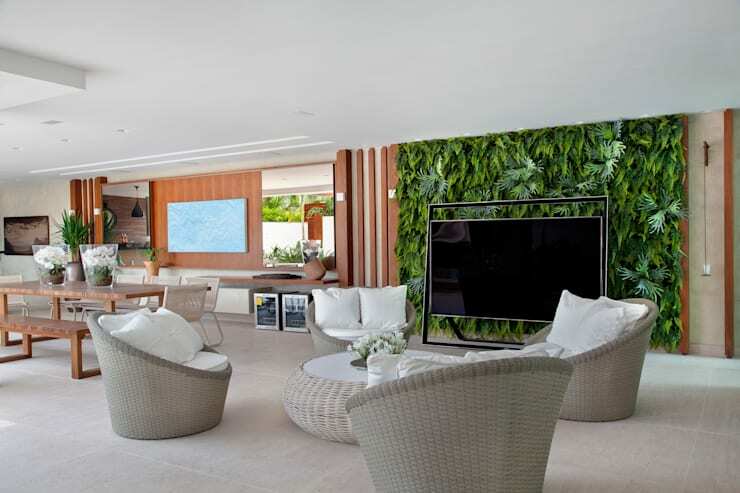 70s-inspired wicker furniture and wood-veneered walls, giant screens and leafy backdrops… this is a space that isn’t afraid to assert its own character. 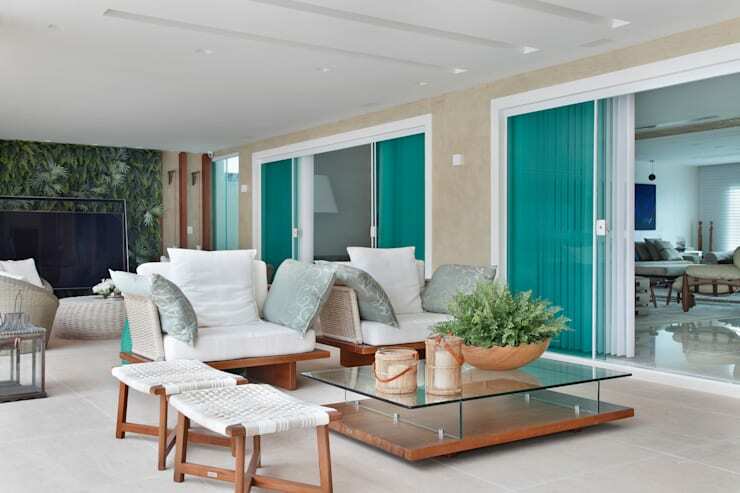 Glass sliding doors maximise the feeling of openness throughout the interior. 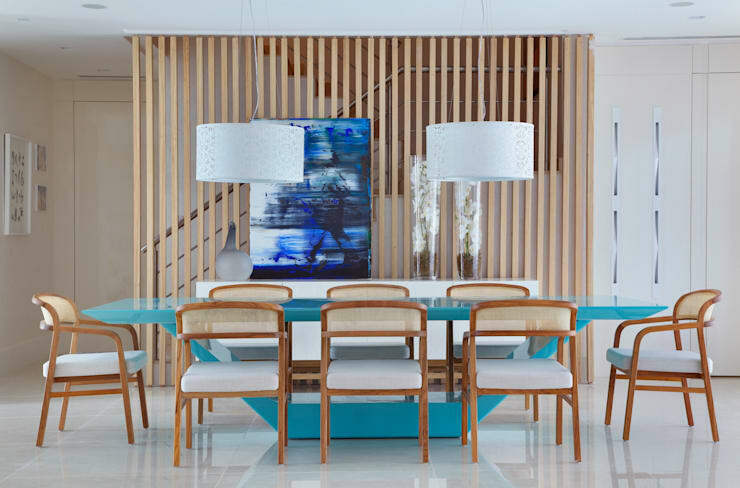 A closer look at that wood veneer wall we’ve already caught a glimpse of shows how closely its grain matches that of the simple table and bench placed in front of it. Meanwhile, the breakfast bar in the background provides even more seating in a home that s far has been full of it. Using curtains and glass doors to section off different parts of the house means it’s possible to delineate each area without breaking the flow of the design. Here, another seating area is separated from the rest by a white curtain. 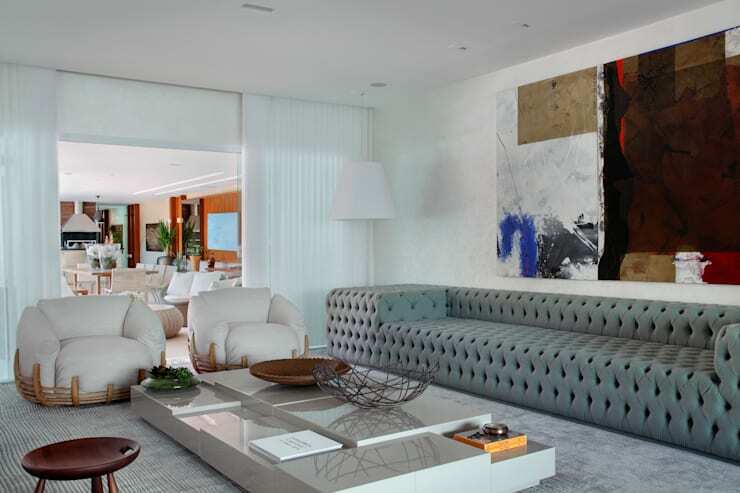 Its heavily padded chairs and sofa convey an impression of extreme comfort and indulgence. Once again, there are more subtle dividers here, this time in the form of the narrow wooden plans that separate the staircase from the rest of the room without closing it off. In the foreground, the unusual shape of the table seems very much like something from a 70s vision of the future, while the chairs reinforce the 70s theme in a more traditional way. 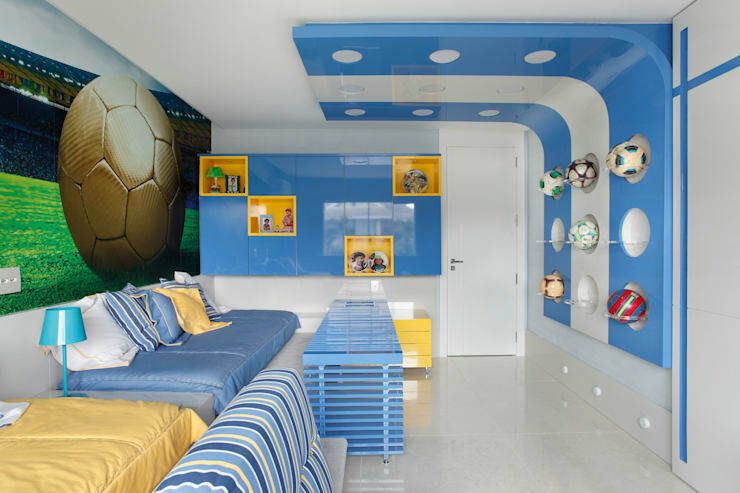 This vibrant child’s room takes the courageous route of using multiple clashing colours instead of just one or two. The combination of the painted balloons on the walls, the multi-coloured lampshades and the use of different coloured stripes lends a circus-like feel to the space. It’s safe to say that whoever inhabits the second child’s bedroom, seen here, has more than a passing interest in football. In the master bedroom, giant padded head boards and decadent bedding act as further evidence of the commitment to comfort that we already saw in that heavily upholstered living area. The walk-in wardrobe seen here is large enough to pass for a small shop. In the bathroom, total peace is just a few steps away. 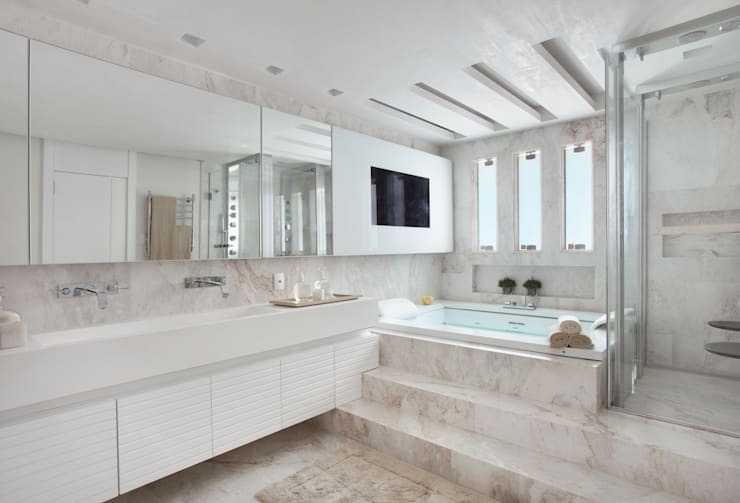 Once you’ve ascended the short staircase to this gorgeous sunken bathtub, the embedded flat screen TV in the wall above will provide enough stimulation to make sure you never get bored of relaxing. What's good and bad about this project? Is there anything you would change?